The easiest way to make scars and some burn effects is with Collodion. 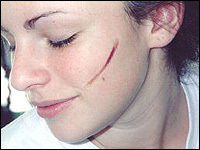 The first thing to do is test a little on the person who will be having the scar. Some people have sensitive skin and collodion can be harsh. 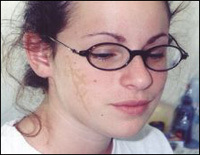 Collodion makes an effect on the skin by drawing the skin together as it dries. The first picture is Collodion layered on the skin. I put on about three applications, the more you use, the deeper the effect, to a certain extent. It is also good to use on fleshy parts of the skin and not on places where the skin is tight. Give the Collodion something to work with. The 2nd picture is Collodion with some Aquacolor makeup over it, I used the color LAKE. You can use just about any makeup or blood and put it over or under the Collodion. I like the Aquacolors. They are applied with a small amount of water on a brush or sponge. The 3rd picture is Collodion alone. I was going for a scar effect. But it looked better when I added some Aquacolor LAKE makeup over it. To remove Collodion you can either peal it off or help it along a little with a remover such as Super Solv or Isopropyl Myristate.